This is my first apartment of my own; I moved here about 16 months ago and decorated it from scratch. Dining/Desk Area, Main Living Space. The plates are a mix of vintage and modern (Tiffany's, Anthropologie, Wedgewood, Urban Outfitters, and thrift stores). 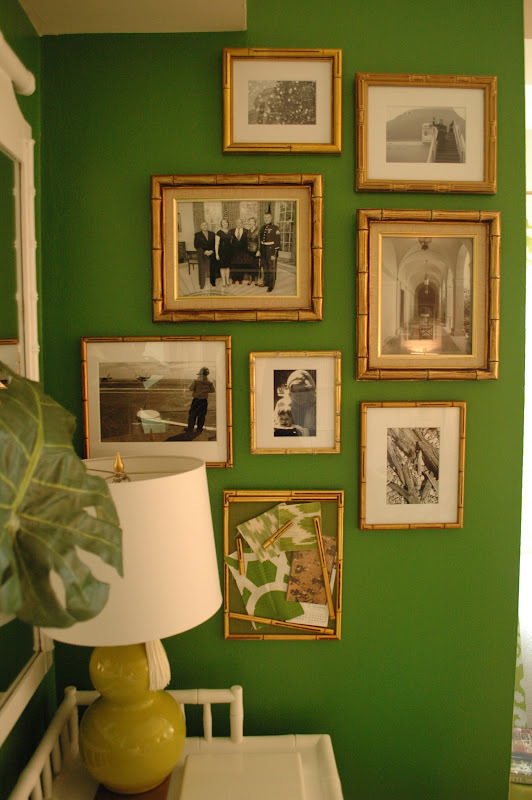 All frames are finds in vintage and thrift stores. I took photos that had personal value to me, and gave them uniformity by printing in black and white and adding white mats. 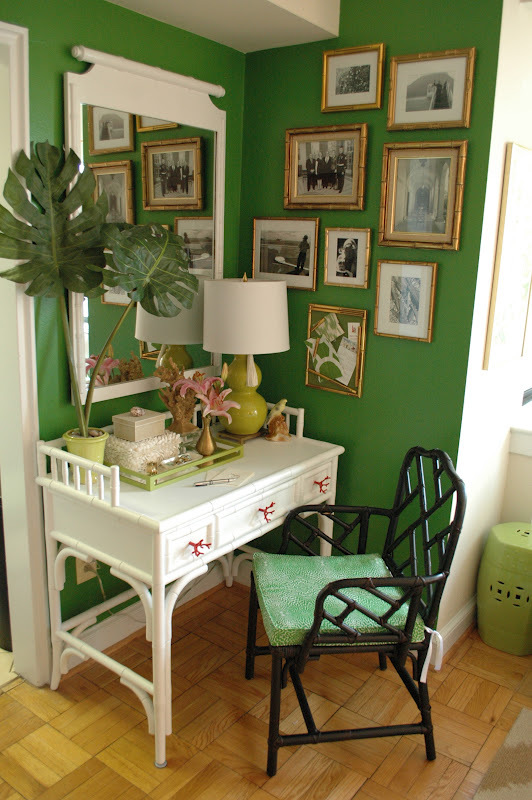 Lamp: Crate & Barrel; desk, Home Decorators Collection; mirror, thrift store and painted to match the desk. The Foo Dog is a family piece; my parents bought it in Asia years ago, and I ran off with it! I sewed the pillows myself from a Tommy Bahama tablecloth found at Tuesday Morning. The photo I took of cherry blossoms at the annual D.C. festival; the frame is IKEA, with the mat wrapped in Thaibut wallpaper, found at a sample sale. 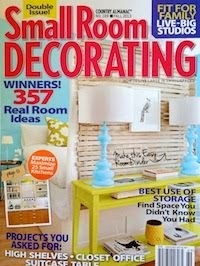 Chairs: Ballard Designs; stool: Cost Plus World Market. 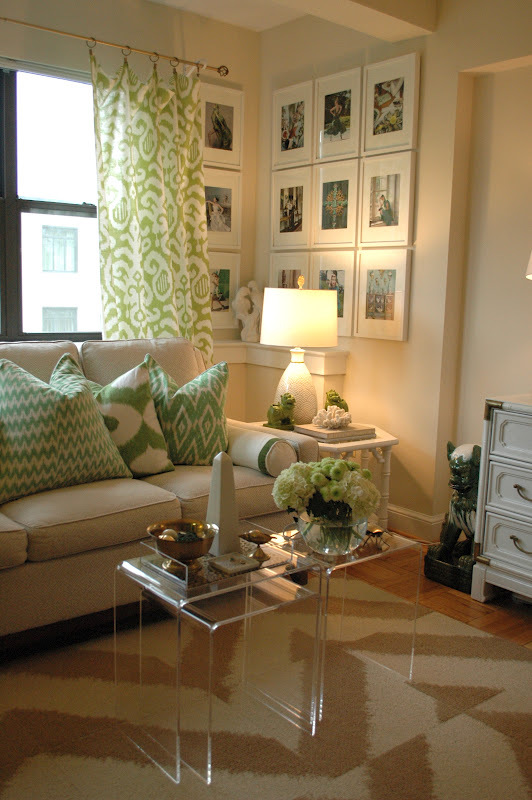 The dining cushions were custom made by my mother; fabric is Premier Prints. The frames are from IKEA and a hotel furniture re-seller store outside Atlanta (all were $10 a piece). The prints of winter scenes at the White House were Christmas presents to staff when I worked there; the orange photos of stylistas are ads from Kate Spade and J.Crew, respectively. Mirror from Home Goods. Ribbon hanger from Wal-Mart. Pillows from West Elm and Etsy; screen is vintage (found in an Alabama antique store for $150). 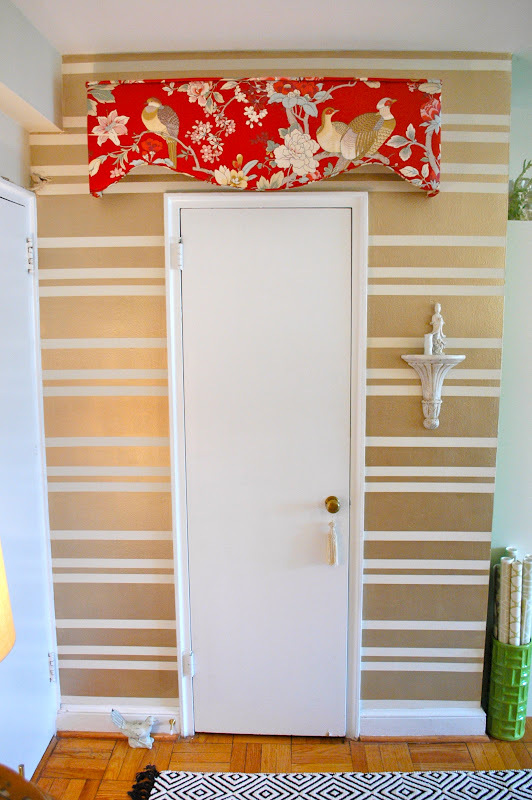 I taped off and painted the "hall" wall, using Martha Stewart gold accent paint. The piece over the door is a window valance I found for $5 at a church yard sale; the brass white-washed sconce and geisha statuette are from a flea market. The rug is from Pier One Imports. Living Room. Couch was purchased as a floor sample in Alexandria; pillows are from Etsy and Wisteria. 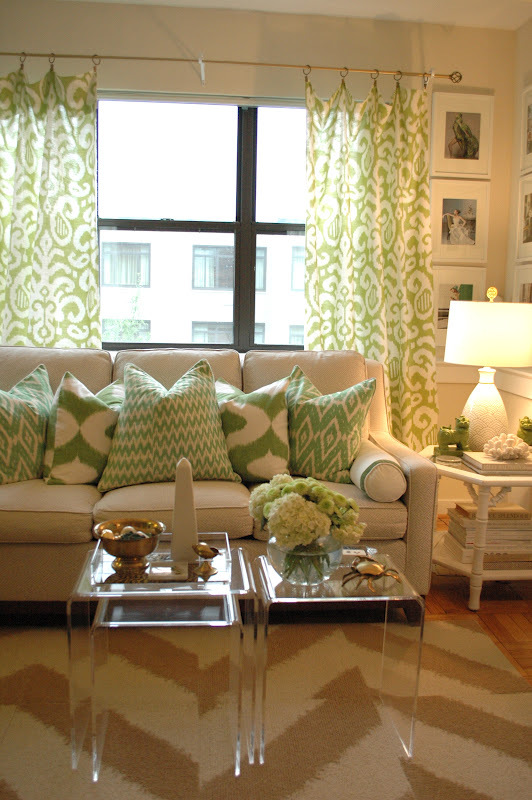 The small bolster pillows are Ballard Designs, and I added the green ribbons. 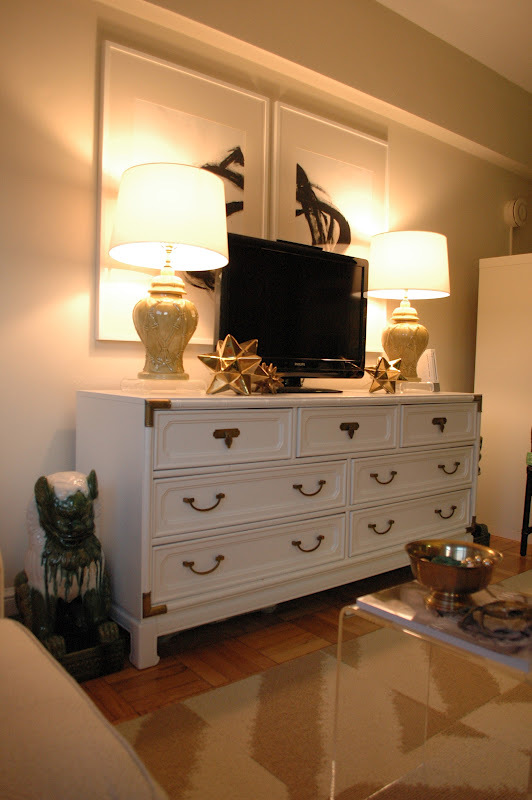 Side table is from vintage shop Circa Who in Florida; coffee tables, CB2; sideboard is from Etsy, re-painted. Living room corner; the wall display is IKEA frames, filled with my favorite magazine clippings. Total cost: $120.00. The little green foo dogs are a Target buy spray-painted to match the room. Rug is carpet panels from Flor; "artwork" over the credenza I created from black paint and posterboard in IKEA frames. 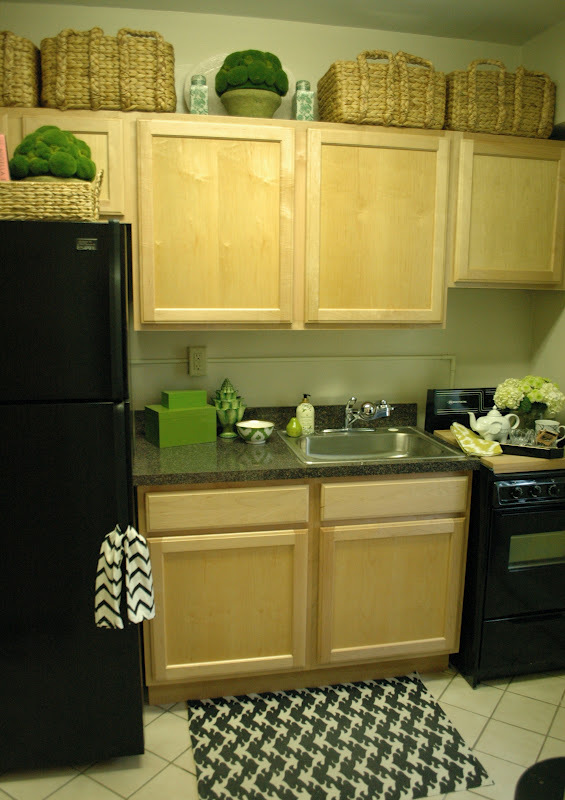 Kitchen: Extra storage from World Cost Plus Market baskets; topiaries from Home Goods. Laquer boxes from The Container Store. 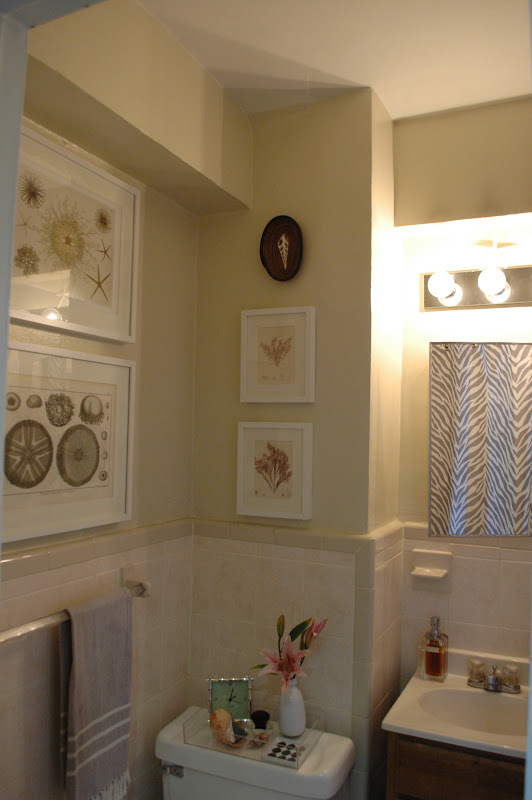 The bathroom - the mirror reflects a gray and white zebra shower curtain. Antique pages from nature books (found at flea markets) are hung in - what else - IKEA frames. Turkish bath towels found at Eastern Market, a special DC open air market on Capitol Hill.